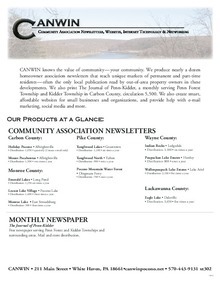 Here are the current media kits for our publications, listing rates and ad sizes. In addition, we also offer classified ads starting at $13 per column inch (approximately 25 words), and Service Directory ads. Fill in the form below, or call 570-443-9131 xt302 to learn more. Rates and sizes for advertising in The Journal-Herald, published weekly. Deadline is 5 p.m. Monday. 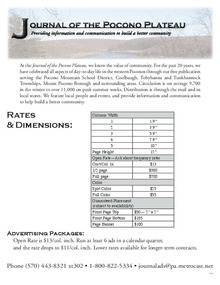 Rates and sizes for advertising in The Journal of the Pocono Plateau. Through the winter, we will be publishing a new edition every other week, with weekly distribution. Weekly publication will resume in the spring. 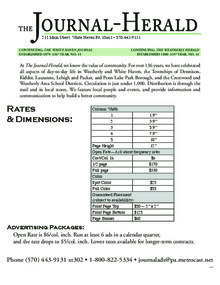 Rates and sizes for advertising in The Journal of Penn-Kidder, published mid-month every month, as well as various community associations throughout the area.